The depths of the Bowen Craggs Database hide some marvels that can help us all. David Bowen goes digging. I have been doing some ‘data mining’ of the Bowen Craggs database to find things that are well done, but that may – unless you too go digging in the Database – never come into your view. I call these nuggets the best of the best, but I don’t want to get into arguments about them. They may or may not be the very best, but they are all jolly good. The choice is fairly random. They are all specific, but have lessons that go beyond their immediate purpose. They are, in other words, designed to provide a little stimulation as you wonder what to do with your lovely corporate website. I could easily go into the Database and find another selection. And these are all from websites; social media could (and probably will) provide another crop. 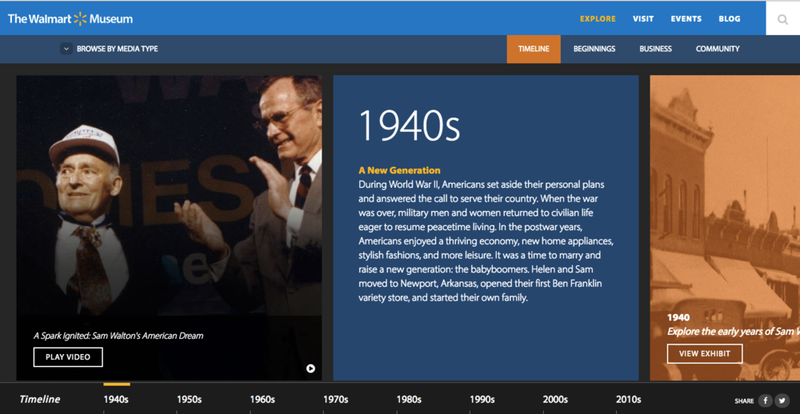 The Walmart Museum website features an attractive timeline exploring the company’s history. It includes embedded videos, links to beautifully designed 'exhibition' pages that draw on artefacts that are preserved in the physical museum in Arkansas, and 360-degree images, including one of founder Sam Walton's office. An excellent example of the internet helping to bring a story to life. Maersk's whistleblowing website is unusually (and helpfully) signposted on the main site. It is not run by Maersk, to provide independence, but has a simple and effective design with instructions on how to blow the whistle on the company online or by phone. A lesson in how to be open, and be seen to be open. As part of the company’s CSR service, Henkel has a page with 10 named contacts. Each individual is identified with a headshot, job title, location, direct phone number (also available via Skype), direct email and downloadable business card. This may seem obscure, but it is a neat way of showing how much emphasis the company gives to CSR. Google's Our locations feature includes a comprehensive map-based directory of all Google locations globally. It includes spotlight pages for key office locations such as New York, London and the global HQ in Mountain View. A simple photo carousel is the centrepiece of the spotlight features - inexpensive and highly effective in terms of letting jobseekers see behind the scenes. A rather obvious way to attract employees, but still rare. Video webcasts are often sophisticated, but few cover the bases as well as Axa does. The first plus point is that you do not need to register to watch a webcast. The video itself gives a batch of useful options, most particularly the ability to browse by slide (fairly common) or ‘chapter’ (rare). So it is easy to jump to bits of the presentation you are interested in, or to the Q&A session. A master class in usability. Commonwealth Bank of Australia has a very clear set of Frequently Asked Questions, mostly aimed at private shareholders. Nothing fancy, just well classified, with a list of questions at the top jumping to the answer down the page. Simple is often best. The Home Depot’s careers videos range from jolly tours of offices with musical soundtracks to employees talking about themselves. The Vimeo productions are classified by job areas (supply chain, technology, etc) and appear in overlays. The videos use contemporary editing techniques to make working at the company seem exciting and inspiring. The LVMH 'Talents' section for jobseekers invites users to 'take a glimpse at the daily lives of our employees'. These short fly-on-the-wall films follow a range of activities across the company's brands, ranging from a press team meeting at Paris department store Le Bon Marché to a morning briefing at cosmetics brand Sephora in New York. Unscripted, with no soundtrack other than the sounds of the workplace, these give an unusually immersive glimpse into life within the organization. More sophisticated than Home Depot’s videos, but both are appropriate to their audiences. OK, perhaps I should have called this best product selector mechanism, but I like ice cream. TetraPak’s ProductXplorer site has a very clear tabbed system letting you find your way to what you want by 'technology area', 'category' or ‘ice cream specific’ (how could I resist?). Each product page is long but has an index at the top letting you jump to different bits, including features, options, and a neat 360 viewing device. The stick insertion machine looks super. Top use of easy journeys and simple web technology.